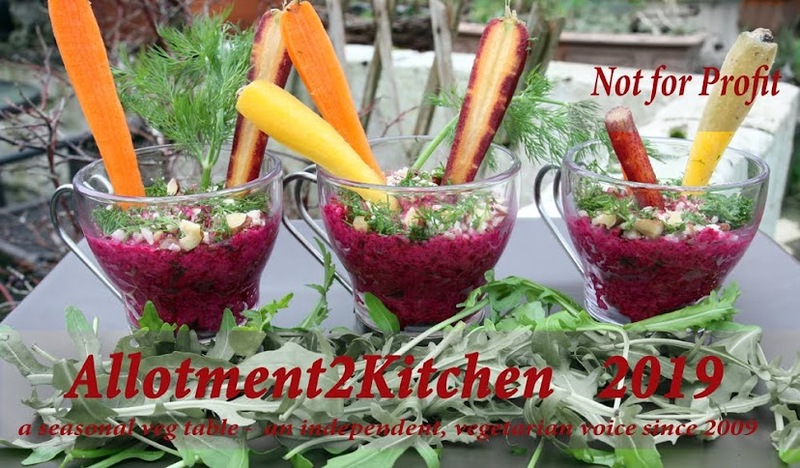 The idea behind 'The Vegetable Palette: natures colours - natures goodness'' is to make something with either a fruit, vegetable or combination of both each month. 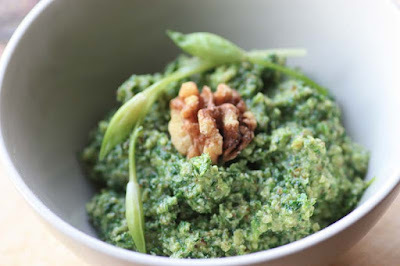 You can make absolutely anything that you wish - sweet or savoury - from a soup, a salad dish, a smoothie, a juice, a stew, a hot pot, a curry, a pie, a pasta dish, cookies or even a cake - absolutely anything, so long as the recipe is vegetarian and includes a vegetable/and or fruit with the chosen colour. The theme for August was Oranges and Mellow Yellows. 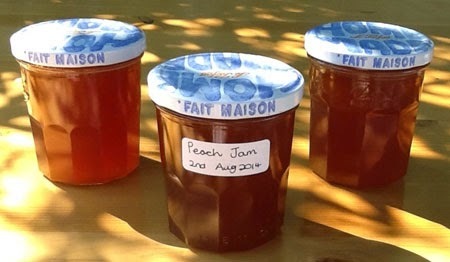 To start us off, Sarah James who blogs over at Tales from the Kitchen Shed shares her recipe for Slow Cooker Peach Jam. It is stunning and beaming with delicious edible, spreadable gold. I love the sound of this recipe, and its ease to make at home - no need to stand over a bubbling pot. We have another Peach Jam recipe, which is very different from the one above. 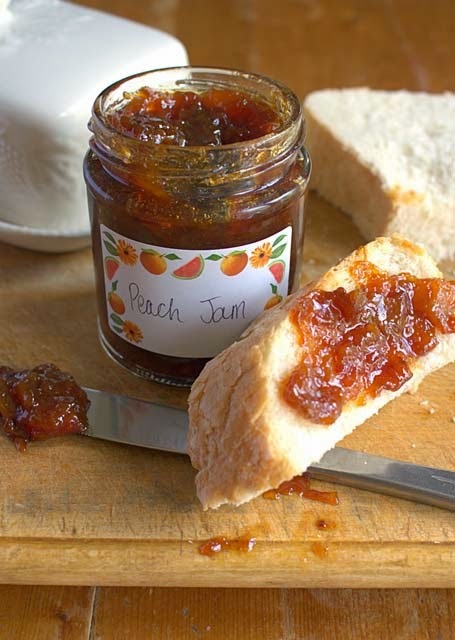 This summery, fruity and sweet Peach Jam comes from Laura at I'd Much Rather Bake than... Laura writes 'An ideal way to make summer stretch into the months ahead'. I know I would prefer Peach Jam to Marmalade any time of the year. Now onto the salads. We have a gorgeous plate of Summer Salad with Fresh Baby Bocconcini Balls by Juliane at Style Nectar. 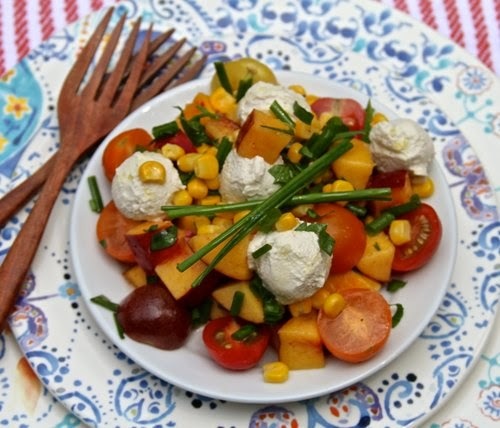 This Summer Salad is made with ripe nectarines, colourful cherry tomatoes, golden corn and coriander and chives. And to top it off, made with home-made vegan 'mozzarella' . Now that is impressive and inventive. 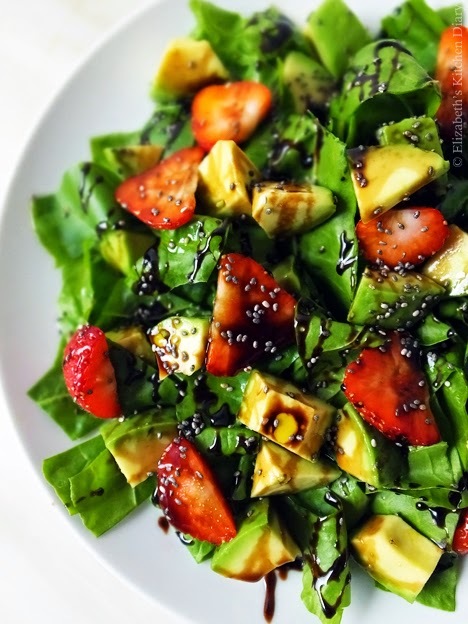 Elizabeth from Elizabeth's Kitchen Diary has shared Avocado and Strawberry Salad with Balsamic Reduction. Elizabeth has convinced me that Avocado has a mellow yellow flesh. The Balsamic Reduction is made with flax oil blend. I love that, as a vegetarian I include flax oil in my diet, but to use it as part of a dressing, even better. 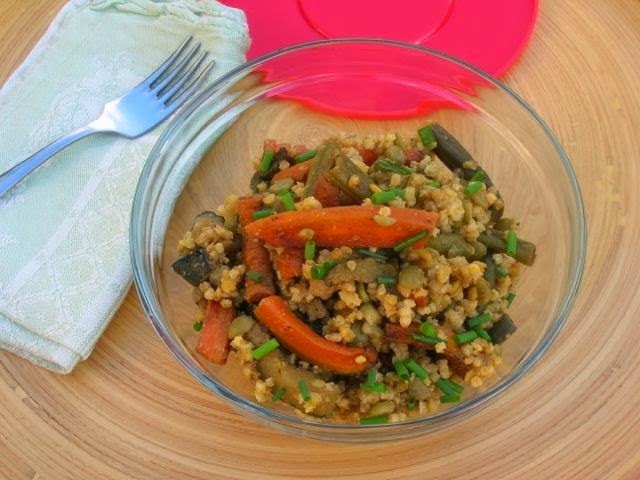 My lovely blogger friend Choclette from Chocolate Log Blog shares a Spiced Roasted Summer Vegetable Salad with Millet, Peas and Lentils. The orange comes from the carrots. An Arabic Spice Blend: Hawaij - a blend of black pepper, caraway seeds, cardamon, saffron and turmeric. I am also very intrigued by her Chocolate Balsamic Vinegar too. Now we move onto tasty morsels. 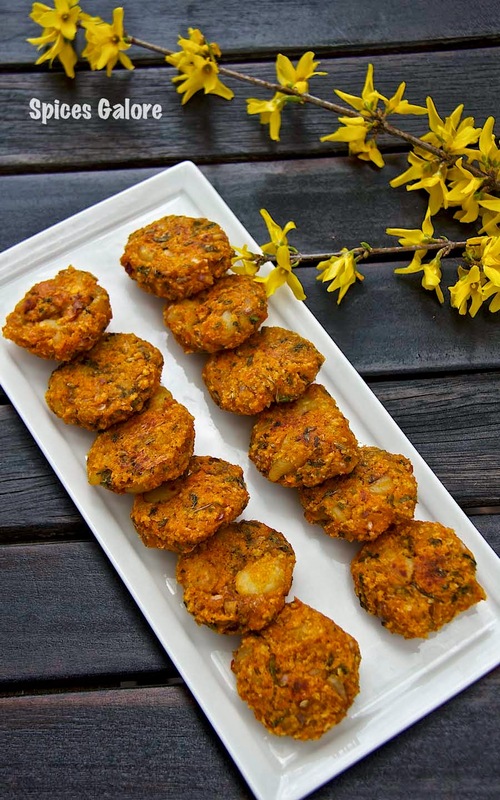 Gayathri from Spices Galore shares some utterly gorgeous looking Sweet Potato and Fenugreek Cutlets. These crisp, golden cutlets are versatile and would be fantastic as a Veggie Burger too. 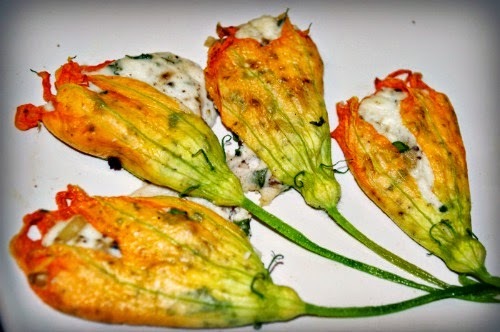 These shallow fried golden Stuffed Courgette Flowers come from Galina at Chez Maximka. 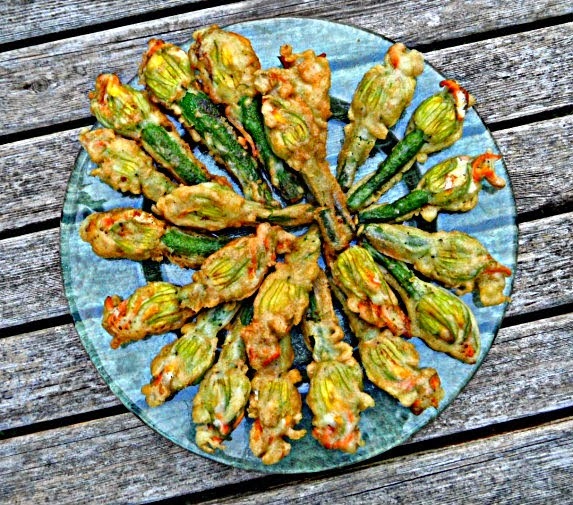 I dream of the day, I have so many courgette flowers in my garden, as this recipe is one that I have wanted to try for a very long time - one day. Now all I can do is only imagine eating one of these bronzed crisp flowers filled with herby soft cheese. Crisp, light and fresh. 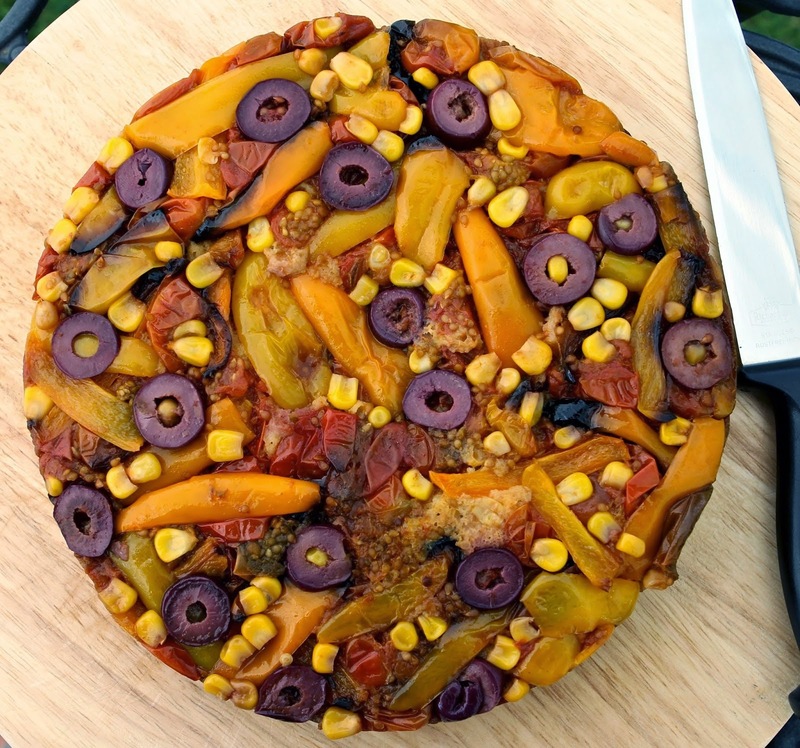 Kate at Gluten Free Alchemist shares a very fetching Savoury Summer Upside Down Cake made with yellow courgettes, yellow and orange peppers and sweetcorn. I love how it is also studded with black olives, giving the cake a little additional piquancy. This is a fantastic alternative to pizza and far more healthier. I really want a slice, but now the only way I can is to make it - so its bookmarked to make in the very near future. Emily from Cooking for Kishore shares Stuffed Squash Blossoms as part of an antipasto platter. These golden blossoms are stuffed with feta, ricotta cheese and lots of fresh herbs. What I love about these most, is that they are baked, not deep fried (I don't own a deep fat fryer , so it appeals more so). Yum licking my lips at the thought of the crisp and crunchiness here. 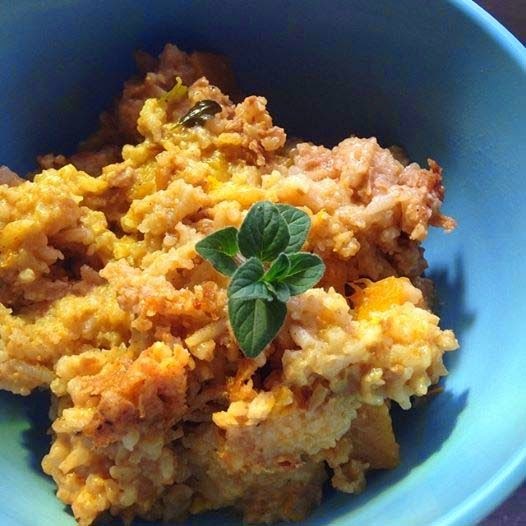 Krys aka the Gangsta Gardener from Dine In, Not Out shares her vegan Butternut Squash and Soyrizo Risotto. What is really interesting and different about this recipe is that it is made in a crock pot known in the U.K as a slow cooker. Krys also shares her vegan Sweet Potato Muffin Recipe. Go on and check them out. 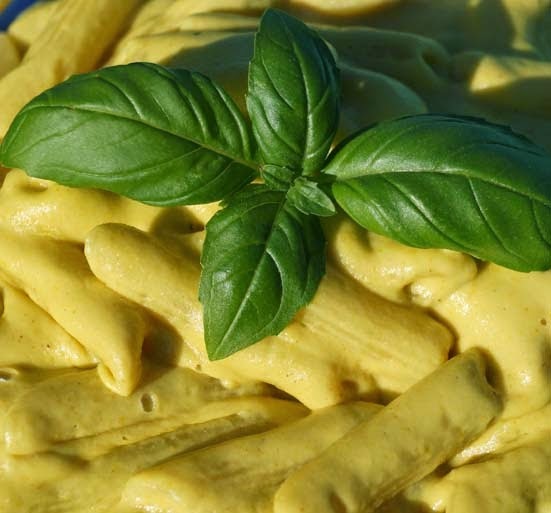 The lovely Jasmine from Self Sufficient Cafe shares a vegan Healthy Mac 'N' Cheese. This recipe is made with Patty Pan Squashes, but what is really clever about this recipe is that it is not made with 'vegan cheese' substitutes. Jasmine has actually used the Patty Pan Squash as the Mac'n'Cheese base. Please go on over and check out her blog for the full recipe. Very innovative and a clever way to disguise vegetables too. 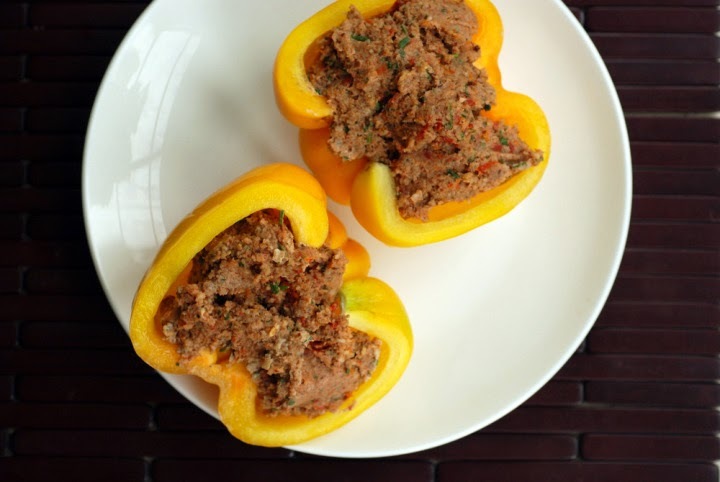 Janet from the Taste Space presents us with these Raw Italian Stuffed Peppers with 'Sausage' Pate, as well as Raw Italian Pate Collard Wraps. The colours come from the yellow pepper and golden beetroot and carrot spiralized. The 'sausage pate' is vegetarian made with mushrooms, nuts and spices. Now onto to some sweet bakes. 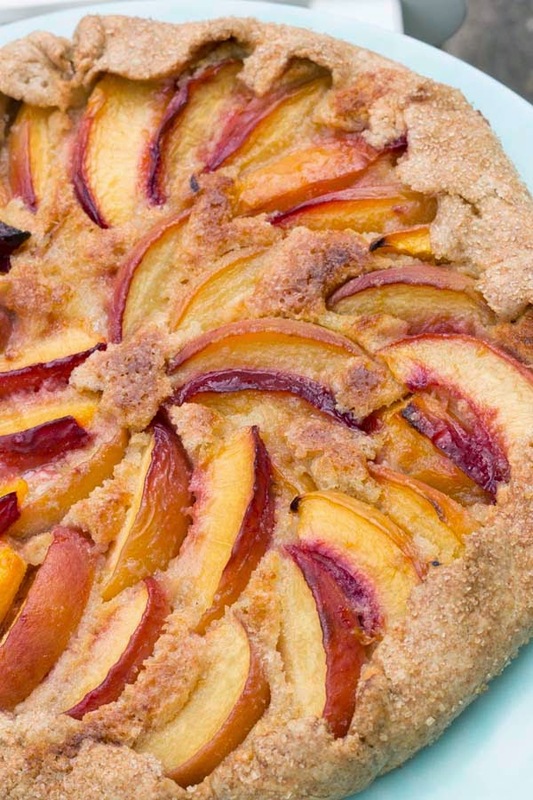 We have a Peach Frangipane Galette from Italian blogger Tortadirose. This galette pastry base is both rustic and elegant, I can only imagine how good it tastes: sweetness from the juicey peaches and nuttiness from the almonds. Comfort. 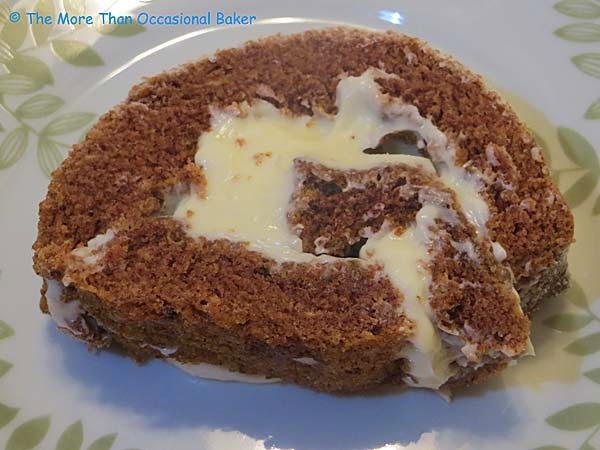 This soft Spiced Pumpkin Cream Cheese Swiss Roll from Ros More Than Occasional Baker. Ros describes the sponge as fragrant with the ground cinnamon and pumpkin puree. Its filled with a sweet cream cheese which compliments the sponge perfectly. This is one recipe to bookmark come Autumn which his literally around the corner for some of us. Caroline from Caroline Makes from shares a dreamy Physalis Cake. 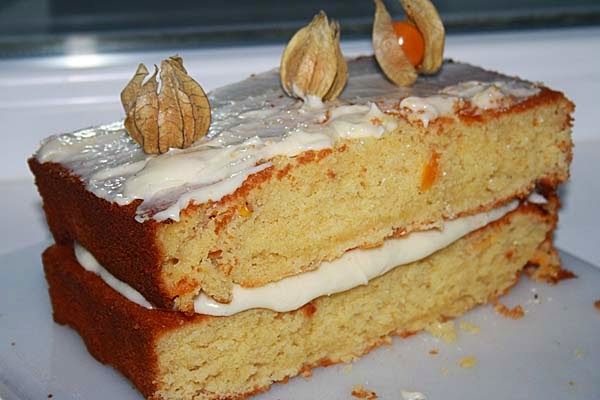 I've had plump yellow physalis, a sweet and sour fruit many times but never in a sponge cake, so I am very excited about this recipe as it makes the physalis the star!. Its a wonderful change from fresh or as a garnish dipped in a little chocolate. 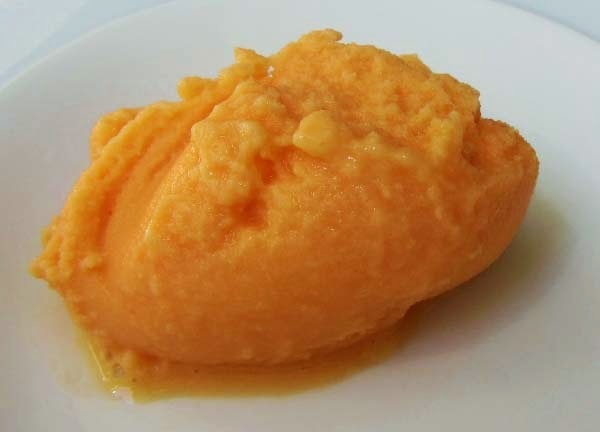 To round off, we have a refreshing, cooling Cantaloupe Melon Frozen Yogurt from Corina at Searching for Spice. Even though this is a cold dessert, the colour just warms me up and whats more its only made with three ingredients - honey, yogurt and melon. I can't wait to try this at home. 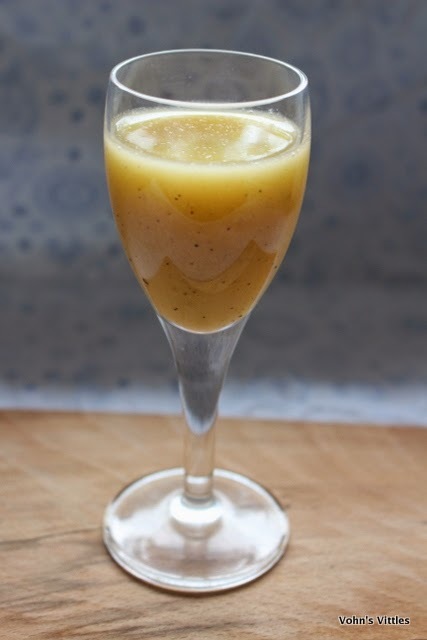 And finally, from Vohn's Vittles Brazilian Passion Fruit Batilda - a quintessential cocktail from Brazil. I am hoping that we still have some sunny weekends left in the U.K, so make the most of this sweet, sour and fruity cocktail. The amazing colour comes from fresh passion fruit. 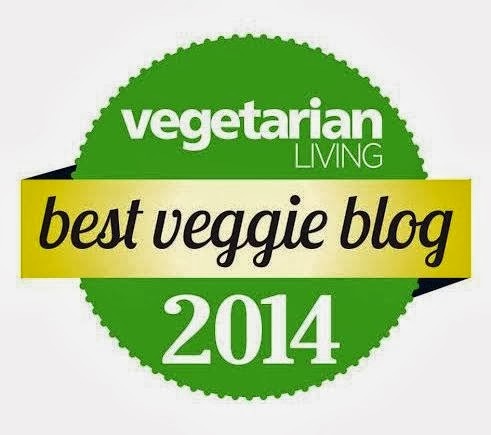 Thank you so so much to every one who has participated this month in the #VegetablePalette. I really hope you will come back and do it all again next month. September 2014 #VegetablePalette Challenge is Purple and Blues...think aubergines, black berries, blueberries, plums, prunes, purple grapes, purple beans, purple carrots, purple cabbage and even potatoes! For details on how to participate follow this link. The round up will be posted at the beginning of October 2014. Thanks Elizabeth. I agree, all yummy too. Such a pretty and colourful round up. I always think colourful food is so much more interesting. Thanks Vohn. Look forward to your entry next month. Another delicious collection. You can see the autumn ingredients creeping in too. Lovely! Thank you. I agree, Autumn is just around the corner. Received your blue entry, your so 'on the ball'. These colours are amazing - what a great round up! Blue is a slightly harder theme but I can imagine some gorgeous dishes coming from that too. Thanks Kari. They so are. I hope you will participate next month. thank you Jasmine. I look forward to seeing your entry, that blueberry cheesecake would have been perfect too. Thank you Shaheen, you've down a splendid write-up and so many gorgeous recipes to wish I had in front of me.